White porcelain, made from a mixture of clay and crushed rock fired at a very high temperature, was first produced in Korea in the Koryo dynasty (918–1392). By the time this wine flask was made in the 19th century, such porcelain had come to dominate ceramic production. 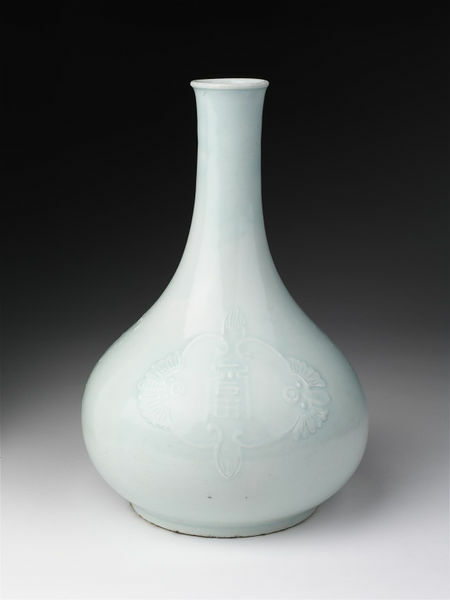 Plain white wares, with their connotations of purity and honesty, were popular in a culture embedded in Confucian philosophy. However, porcelains painted under the glaze with iron brown, copper red and cobalt blue were also prized. Around the body of the flask the potter has trailed decoration in slip (clay mixed with water) featuring Chinese characters meaning long life and happiness, flanked by a pair of bats. Korean art abounds in symbolism: the character for bat was pronounced in the same way as that meaning good fortune, and thus images of bats came to express a wish for good luck or happiness. 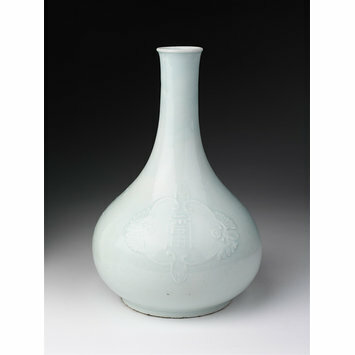 Wine flask of porcelain, covered with a pale bluish glaze. Decorated with slip-trailed characters, 'happiness' and 'long life', each flanked by a pair of bats. Pear-shaped with long narrow neck.